There are many diseases that can affect you in space! The following will come in handy for virologists, traitors, or any unfortunate soul who's come down with a case of brain rot. The first, and most important way to prevent 99% of infections, is proper hazard wear, and knowing how to keep the infection from spreading. If you or another crew member is infected, do not spread the infection further. Seek the isolation bay of the medical wing, or head to a room no one will enter but yourself and other infected. Cleaning blood spills from the ground will prevent contact contamination, make sure blood is cleaned from the floor at all time. Any blood splatter out there could hold a dreaded space infection. Contact a janitor if you see blood on the floor, do not interact with the blood if you suspect possible infection chance. Any object or floor that has infected blood on it can infect anyone who handles or touches it. Airborne - The most dangerous and quick spreading, if you are anywhere within the breathing area of the infected crew member, you have a chance to be infected. Direct Contact - Requires you to touch, been touched, or be extremely close to the source of the infection. The infection will be spread by the skin and bodily fluids of an infected person, but will not survive long in the air. Blood - The infection will be spread by the bodily fluids of the infected person. Special - The disease is not normally contagious and the affected crewman has been infected by a non-human vector source. You can work with the infected without risk yourself unless they expose you to the same vector source that infected them. Every infection is vulnerable to one substance (or combination of two). To find it, you can put an infected blood sample in the PanD.E.M.I.C 2200 machine or use a health analyzer on an infected patient. Administering the substance to the patient (may require multiple injections) should cure him. Alternatively, if you have produced a vaccine, a simple injection should cure the patient. This machine creates vaccines from the blood of people who have been cured. Take a blood sample with a syringe. Place sample into a beaker or bottle. Select vaccine you wish to have. Take vaccine bottle it produces. Reveals the cure to any infected blood sample without needing to inject a living creature. Thankfully, humanity has managed to cure and eliminate almost all of the diseases that plagued its infancy. However, the vast reaches of space have been found to harbor new illnesses that can affect the unprepared staff on Nanotrasen research stations. You are able to create your own advance disease with different symptoms, which will have buffs, debuffs and bonuses! You will start out with two advance diseases, the cold and the flu. The cold will have the sneeze symptom and the flu will have the cough symptom. They have almost no effect if they infect people, but you need them to acquire more symptoms. The Pandemic can create culture bottles (basically copies) of existing viruses, so you won't run out while experimenting. To obtain a new symptom you need to mutate an existing virus. This involves adding a chemical to the virus, which will generate a new symptom. Rarer and harder to acquire chemicals will yield more potent symptoms. You will start with enough chemicals to create a powerful disease, as long as you use them carefully. You can also insert an isolated symptom into your main virus, by moving 1 unit of the isolated culture to the main mix with a dropper. It will not work every time and may need to be repeated a few times. These are the basic chemicals for virus mutation. You can either add them directly to a virus to obtain a random level symptom, or mix them with other ingredients to get advanced chemicals, that will give you a specific level symptom. Virus Food: You can make virus food with Water and Milk. Virology lab has its own Virus Food Dispenser. Mixing this with a disease will give that disease a symptom up to level 2. Unstable Mutagen: You can use mutagen to mutate your disease and give it a symptom up to level 4. Virology starts with a 30u bottle of mutagen. Liquid Plasma: Plasma can be used to mutate your disease to give it a symptom up to level 6. Plasma in liquid form is generally in very limited supply, unless mining and chemistry cooperates with you. Virology starts with a 30u bottle of liquid plasma, and in some station layouts with extra plasma bars. Using these will allow you to both save time and resources when trying to acquire the symptoms you want. Virus rations: Virus rations can be used to mutate your disease and give it a level 1 symptom. It is made by depleting Virus food with Synaptizine. Mutagenic Agar: Mutagenic agar can be used to mutate your disease to give it a level 3 symptom. It is made by mixing Unstable mutagen and virus food together. Sucrose Agar: Sucrose agar can be used to mutate your disease to give it a level 4 symptom. It is made by mixing Sugar or Saline Glucose Solution and Mutagenic agar together. Virus Plasma: Virus plasma can be used to mutate your disease and give it a level 6 symptom. It is made by mixing liquid plasma with virus food. Weakened Virus Plasma: Weakened virus plasma can be used to mutate your disease and give it a level 5 symptom. It is made by weakening virus plasma using Synaptizine. These chemicals require large quantities of liquid uranium (obtained by grinding uranium bars). You'll require the help of mining to make these. Decaying Uranium Gel: Decaying Uranium Gel can be used to mutate your disease and give it a level 6 or 7 symptom. It is made by combining 1 virus food with 1 liquid Uranium. Unstable Uranium Gel: Unstable Uranium Gel can be used to mutate your disease and give it a level 7 symptom. It is made by combining 1 virus plasma with 5 liquid Uranium. Stable Uranium Gel: Stable Uranium Gel can be used to mutate your disease and give it a level 8 symptom. It is made by combining 1 plasma with 10 parts liquid Uranium and 10 parts liquid silver or gold. Synaptizine, aside from being a base chemical, will remove one random symptom to any virus it comes in contact with. It's important if you intend to isolate a specific symptom. For example, if you mutate your Cold virus and it acquires the Toxic Filter symptom, you can try and add synaptizine to it to create a virus which only has the Toxic Filter symptom. Formaldehyde will neuter one random symptom when mixed with a virus. This disables its effects while keeping the attributes intact. This is useful for meeting threshold values without making the virus deadly. When you're adding a chemical to a virus, you only need to add a single unit of it. This means you can use a dropper to add a single unit at a time, instead of using a syringe and wasting 5 units at a time. Since Liquid Plasma and Mutagen are in limited supply, it is a smart move to conserve your chemicals. Remember, you have to use the dropper in your hand once to set its transfer value to 1 unit. While your first instict may be to create a new culture bottle, adding a chemical to it and scrapping the whole bottle if it's not the symptom you want, it is a slow process due to the Pandemic's cooldown. A better way is to instead keep a culture bottle, an empty beaker, and a bottle of your desired chemical; add one unit of culture to the beaker and then mutate it with the chemical, and check the result. Then repeat until you have to replicate the culture bottle: this allows for 20 uninterrupted tries before having to make a copy. When you get the symptom you want, you should isolate it, by making a new culture bottle with the symptom's name on and storing it in your fridge. You can then move 1 unit of the blood containing the isolated symptom into your work mix to add it. Doing this will make it much easier to build different viruses with the symptoms you have, instead of being locked in a single combination. Even better is if you use synaptizine to remove the base symptom, so you have the pure symptom ready to use. A virus can have up to six symptoms. There's a downside to having too many symptoms: they are less resistant and less likely to spread. After you're done mixing your disease, stats from the symptoms are added together to make disease stats. Viruses have a default of 0 in every stat. Stealth: If stealth is 2 or higher your disease will be hidden from medHUD and scanners. Generally it will also hide the warning signs of symptoms before they activate. Transmission: Improves the chance each tick to spread the virus, increases the amount of protection you need to prevent infection, determines the infection vector, and is needed to override other viruses. The infection vector is calculated with (disease's transmission - amount of symptoms). 2 or less is blood, 3 is fluid contact, 4 is skin contact, 5 is airbone. The Sneezing symptom forces sporadic airborne spreads, but does not otherwise affect this. When infecting someone who already has a virus, if the infecting virus' Transmission is higher than the other virus' Resistance, the latter will be overridden by the former. Stage speed: Increases the chance of advancing a stage each tick. It will be 2% or stage speed, whichever is higher. Resistance: Makes the virus harder to cure; determines the required chemical to cure, decreases the chance of it being cured each tick when in contact with the cure, and defines how resistant the virus is to being overridden by other viruses. Severity: A hidden statistic. The symptom with the highest severity defines the virus' severity; it affects the color of the medHUD icon, ranging from blue for positive viruses, to flashing red for extremely deadly diseases. The chance of it being cured every tick is 15 - resistance, but always between 10 and 20. The cure is determined by [resistance - (amount of symptoms / 2)]. Hover over the thresholds to see the effects of each. If you happen to run out of plasma, chemistry sometimes has an extra bar you can ask for. Sugar can be hard to find, but you can use Saline-Glucose from any NanoVend Plus for Sucrine Agar. Wearing protective clothing is not necessary during virology research, but you should wear it in event of an outbreak or while experimenting on monkeys. If you're dealing with a virus too stealthy to analyze, you can try making a very infective virus to override it. Have in mind the disease you want to make before you start searching for symptoms: knowing the level of the symptom you're looking for may save you time and materials. While it's possible, you should refrain from using only plasma to get the symptoms you need, as it can run out very quickly, and without it you can only beg mining for more plasma bars. 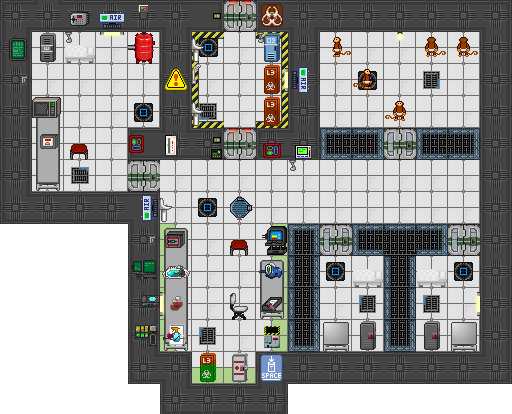 Being a traitor virologist opens you up to a whole variety of cruel and interesting ways to create chaos on the station. Here's some tips to allow you to spread your worst creations. Here is where statistics become important: you need Resistance to avoid the cure being salt, you want Transmittability so your virus can spread, Stage Speed so it acts before the victim is cured, and Stealth to avoid it being noticed too quickly. You won't have them all on a single virus, so choose the direction you want to go with. A high stealth will allow the virus to incubate before the victim notices. A high resistance will make the cure so rare that it won't realistically be available to everyone. Beware of vaccines, though. A high stage speed will cause your virus to progress at extreme speed, giving targets less warning before acting. A high transmittability will allow you disease to spread itself without your help; it will also make it so you need more clothing to protect from infection. While it might seem a good idea to put many harmful symptoms on a virus, its stats will be lowered to the point it won't act before it is cured. Stick to one or two harmful symptoms, and add neutral ones to buff its statistics. All symptoms give out messages to the infected before they reach the stage where they activate. People will be aware of what is hindering/killing them. Consider investing in stealth to prevent this. Going around outside of virology with a biosuit will alert people that you don't trust your own virus: you might want to infect yourself with a harmless resistant virus, so people can see that you're infected as well, while you'll be immune. Remember that live and walking infected spread more than corpses. Consider making a disease that hinders many instead of one that kills a few. Although dead people can't work on a cure. A syringe gun filled with infected blood is a good way to spread viruses if you can't trick the crew. Sabotaging the Pandemic is usually a good idea, as it can create a vaccine for a cured virus which is cheap and easy to distribute, even if the virus is extremely resistant. Sabotaging the holodeck computer is also a good idea because its Emergency Medical simulation also contains a Pandemic. Sabotaging chemistry can stop them from making most of the chems that can cure viruses. Adding your virus to food the chef has cooked is a good way to spread your virus. Virology has been reworked to add threshold bonuses to symptoms. If the specified statistic goes over the threshold, the symptom will gain the relative bonus. You can now neuter symptoms, making them inactive, but still able to affect statistics. Use them to empower positive viruses without killing your patients. Adding formaldehyde (now in the smartfridge) will neuter a random symptom. Stealth no longer hides viruses from the Pandemic, but it will hide many early warning of infection instead. Maximum amount of symptoms is now 6.